This USB-C(Thunderbolt 3) card reader is designed to view/save/delete/share photos and videos (and other data) from your TF/SD card to your laptop/computer, phone and tablet, so you can view them on the gorgeous display and share them with family and friends in the field. - Support Memory Card: SD, SDXC, SDHC, Micro SD(TF), Micro SDHC, Micro SDXC. - System support: Windows XP/vista/7/8/8.1/10, Linux 2.4 or above, Mac OS 10.0 or above. No driver needed, powered by USB-C, ideal for travelers. 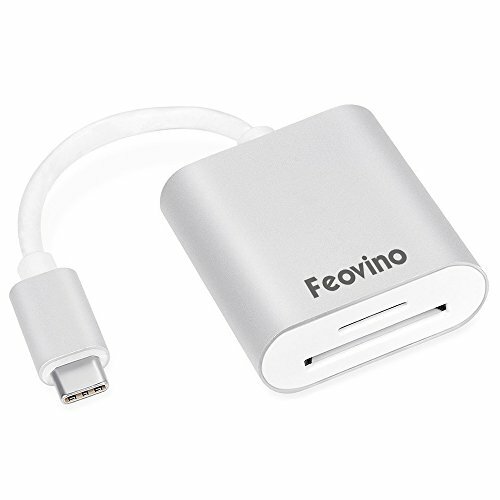 This usb-c to sd card reader does NOT support iPad Air /mini /iPad /iPhone. - This product comes with a one year warranty and life-time service support. - You could mail us via"feovinostore@yahoo.com" for any questions. ★ High-speed Transmission -- USB 3.1 Type C Superspeed Aluminum Card Reader Adapter provides superior transmission performance. Ultra-fast data transfer up to 5 Gbps, Backward compatible with USB 3.0/ 2.0/ 1.1/ 1.0. ★ Compatible Devices -- Compatible with Apple MacBook Pro 2016/2017, New MacBook, DELL Venue Pro, Dell XPS 12 9250, 13 9350/9360/ 9365, 15 9550/9560, Alienware 13/15/17, Lenovo Yoga 900, Chromebook Pixel, Samsung Galaxy S8/S8+ and more USB-C Devices. ★ Universal Compatibility -- Memory Card Adapter Support SD, SDHC, SDXC, Micro SD, Micro SDHC (UHS-I), Micro SDXC (UHS-I) and Easy to work other devices with a type c port. Operating system: Windows XP/Vista/Win7/Win8/Win8.1/Win10, Mac OS. ★ Easy to Use -- Plug-and-play, no driver needed. Lightweight and portable. Powered by USB-C port, no external power needed. ★ After-sales service -- No quibble 18 months warranty is friendly offered. Fast response within 18 hours. Professional technical guidance. If you have any questions about this product by Feovino, contact us by completing and submitting the form below. If you are looking for a specif part number, please include it with your message.